One BIG kiss coming your way Wynonna! SMACK! and Happy St. Paddy's Day, 7MSN! HA!!! Thanks for the reminder it is St patricks day eh! What a cute face......Happy St. Patty's day! Sending a big kiss and hug to Wynonna today. 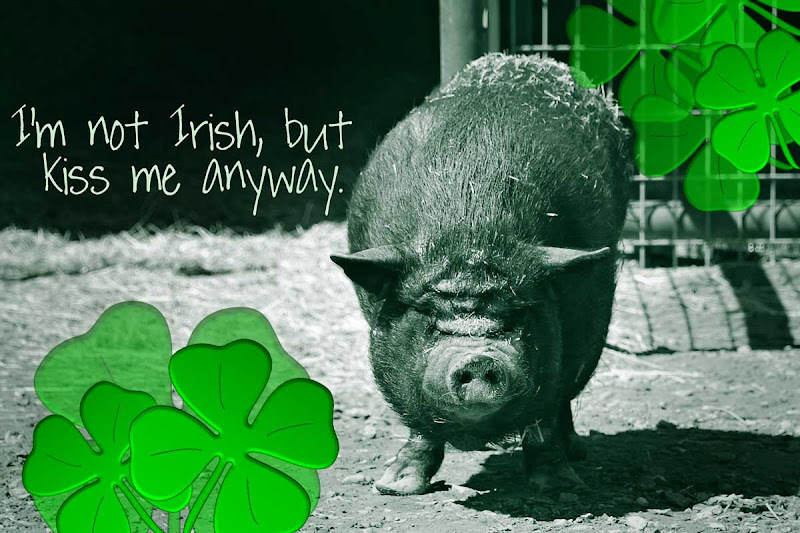 She certainly looks as 'Irish as Paddy's pig'! Love her kissable snout. I've never kissed a real pig before so here goes...smooch smooch. Happy St Paddy's to you Carson and the rest of the happy bunch. Happy St. Paddy's Day Wynona! You look great in green hun! you're the luckiest girl I know, I'd plant a big one on ya honey. Oooo a big kiss on the snout from me! I love pig snouts. Big kiss for you Wynonna! Seriously, would she let me plant a wet one on her...? Carolynn, you'd have to get to know her a little first...maybe take her out to dinner...buy her a drink. Great to see the Porcine Princess out of her Pigloo. Happy St. Paddy's day Wy...and the Luck 'O the Irish to all yea at the 7MSN. The critters residing at Windfall, in O'Washington State. Whooo! How sweet!!! Love and kisses to you, Winona. And if I could don'tcha know that I would proudly plant a peck on the point of your porcine puss! With pleasure! You GOT it, Wynonna: ((SMACK))!! Come to me and give me a big wet kiss, Wynonna!